In 1955, a medical student, Samuel B. Aronson II, was working in a research lab run by Frank Dixon, MD. During a “gripe session” at a local pub, the two discussed problems at the medical school. Out of this discussion came the idea for a class play. Scope & Scalpel is a satirical, uncensored play produced annually by fourth year students at Pitt’s School of Medicine. 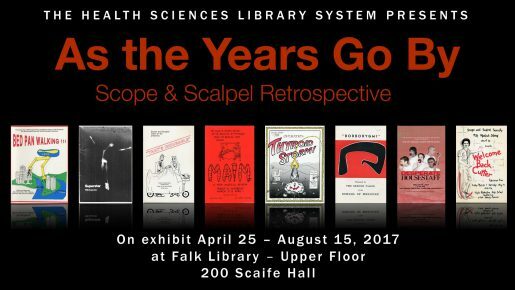 To honor Scope & Scalpel, a new art exhibit recently opened on the upper floor of Falk Library in the quiet study area. 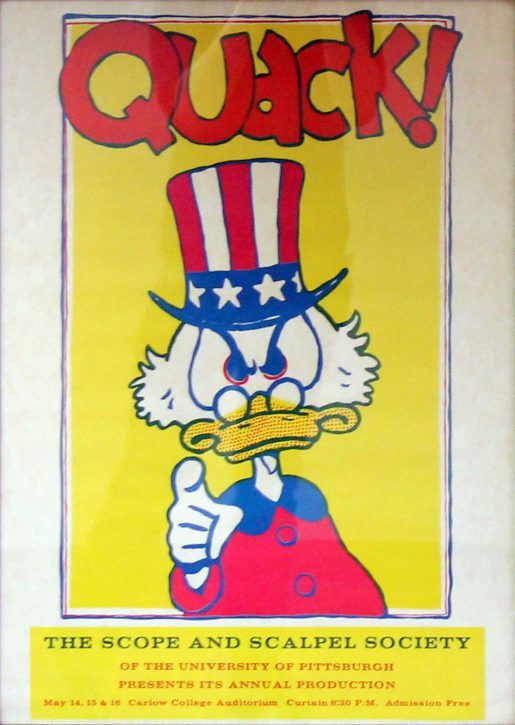 The exhibit, entitled As the Years Go By—Scope & Scalpel Retrospective, presents an array of posters from sixty-three years of Scope & Scalpel productions. The posters are accompanied by a selection of clips from past performances which can be viewed and listened to at the media station. There is also a related display in Falk Library’s front lobby. The opportunity to view the posters, with parody titles such as “The Girl with the Pearl” (1957), “A Stitch in Time” (1961), “Scar Trek” (1975), “Bed Pan Walking” (1997), and “Desperate Housestaff” (2007), makes your time in the library a little more fun. You can also listen to the old hit songs, and immerse yourself in the memories of the medical school experience as remembered by former students. As hard working and devoted to their studies as they are, every year the medical students find the time to produce a new show. The exhibit is proof of their imagination and creativity. If you are a medical student inspired by what you see in the exhibition, perhaps you may wish to join in the fun next year.